Welcome to the YA Scavenger Hunt Fall 2017! This bi-annual event was first organized by author Colleen Houck as a way to give readers a chance to gain access to exclusive bonus material from their favorite authors...and a chance to win some awesome prizes! You will not only get access to exclusive content from each author, you also get a clue to help you win the scavenger hunt. Add up the clues, and you can enter for our prize--one lucky winner will receive one book from each author on the hunt in my team! But play fast: this contest (and all the exclusive bonus material) will only be online for 120 hours! The YA Scavenger Hunt page has everything you need to know about the eight contests going on simultaneously. You can enter one or all of them! I am a part of #TEAMPINK -- but there is also a red team, an orange team, a gold team, a green team, a teal team, a blue team, and a purple team -- enter each for a chance to win a different set of books! If you'd like to find out more about the hunt, see links to all the authors participating, and see the full list of prizes, click to go to the YA Scavenger Hunt page. Rules: The contest is open internationally, anyone below the age of 18 should have a parent or guardian's permission to enter. To be eligible for the grand prize, you must submit the completed entry form by OCTOBER 9, 2017, at noon Pacific Time. Entries sent without the correct number or without contact information will not be considered. I am pleased to host McKelle George on my website. McKelle George is a reader, editor, perpetual doodler, and associate librarian at the best library in the world. She mentors with Salt Lake Teen Writes and plays judge for the Poetry Out Loud teen competitions (but has no poetic talent herself). Her debut young adult novel Speak Easy, Speak Love comes out from Greenwillow/HarperCollins in 2017, and she currently lives in Salt Lake City with an enormous white german shepherd and way, way too many books. Find out more information by checking outMcKelle's website or find more about her book here! Six teenagers’ lives intertwine during one thrilling summer full of romantic misunderstandings and dangerous deals in this sparkling retelling of Shakespeare’s Much Ado About Nothing. 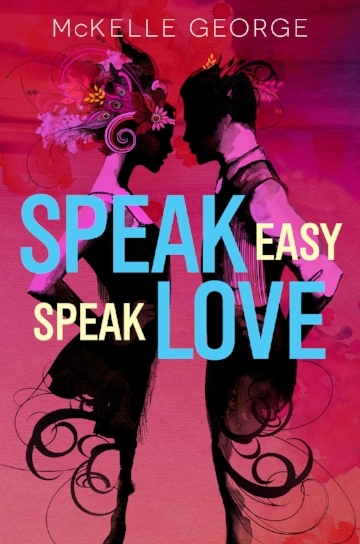 You can take a character quiz and also enjoy the SPEAK EASY SPEAK LOVE Pinterest page. Don't forget to enter the contest for a chance to win a ton of books written by me, McKelle, and many more of your favorite YA authors! To enter, you need to know that my favorite number is 24. Add up all the favorite numbers of the authors on #teampink and you'll have the secret code you need to enter for the grand prize! To keep going on your quest for the prize, you'll need to check out the next author on #TEAMPINK -- Let me introduce Ann Benjamin!